Welcome to the second Issue Quaffee Newsletter for 2013. We have had quite an eventful month, so this newsletter will get you up to date, and introduce some plans for the year. Firstly the big news is that we are roasting out of a temporary home. The wine harvest started and after concerns were raised about the possibility of the roasting affecting the wine, we moved our roaster up to where the old farms dairy was. All is relatively well up there, we just have a small extraction problem, but roasting continues on a roast to order basis as before, just Mzukisi has to clean his hair once a day ;). 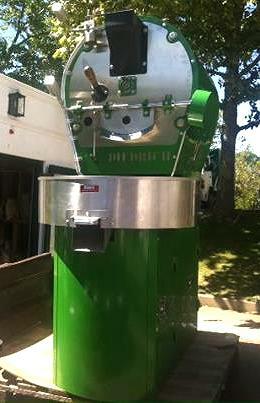 We have in the meantime had the pleasure of our de-smoker arriving. Which we will be testing up at the old dairy, and once we are happy (and the wine makers too) we will move the roaster back home. However we are also remodelling the roastery to have a more effective production area, and be a little more client facing. This however has resulted in us not being able to offer an open day this month at Buitenverwachting. Next month, we are looking at opening on most Saturdays even if it is only for 2 hours between 10am and 12am. During March we will be also opening the little roastery at Morituri based on the Wild Clover farm near Stellenbosch on a more permanent basis. They are already brewing beer on premises and also make good food. We aim to run that roastery at least one day a weekend, probably Sunday. Carl will be there and you can pop in say hi and get some fresh roasted coffee from him. The last of the Sao Judas is available, and the we are next going to offer the Cup of Excellence winner from Guatamala. We will send details of this coffee to those that have selected that they would like to be notified of Limited Edition coffees. Also on this note, we have some exciting news that we are looking at adding to the success of the Limited Edition range. Once of the partners we work with, is identifying a collection of very special coffees. They will need to score a minimum of ninety on the Speciality grade, and then will be sold in 20kg lots on a first come first serve basis, we hope to get in quite a few this year. The Coffee bloC at Buiten has now received 3 rave reviews from different publishers. We have a coffee of the week there, which is always one of our special coffees, and this seems to be quite popular. So pop in have a snack and try the coffee of the week, they way you like it. For those that do not follow us on facebook, we are now selling Ms Silvia, the Rancilio home espresso machine that is as good as a standard commercial machine. We are selling the machine and the doserless grinder, plus all the extras that make it a home Barista’s dream. Also for a little more you can get Barista training on it at home, so you can make the perfect espresso, and even do your own latte art if you are interested in that sort of thing. The Jura range’s price has been the same for over 3 years now, but with the rand losing as much as it has these prices are set to increase by 10% on March 18 this year. So if you are looking for an excuse to take the plunge, then look at jura.quaffee.co.za and choose. Thanks for reading, and you support. 2013 has started well and we appreciate all the good will you are spreading. You are our most important marketing assets, as we believe we prefer to spend money on the product rather than marketing, since our product is our marketing through our clients.